No matter how often I tell my students that daily quickwriting will help them strengthen their writing muscles, I am convinced that some of them still don’t believe me. No matter how often I demonstrate how one can take a quickwrite from the kernel of an idea to published, award-winning prose, I know that some of them still don’t see how this is relevant to them. 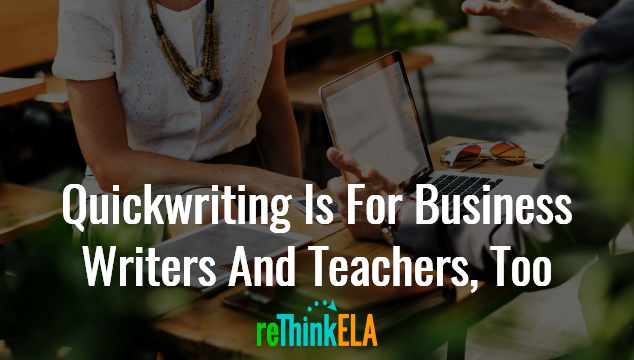 No matter how often I encourage my students to expand their ideas during quickwrites, I hear the grumbling from those who still don’t see themselves as writers. After all, I am just their teacher. An English teacher. Of COURSE I’m going to tell them that writing is important, that they have a voice, that they should tell their stories. That’s what I’m getting paid for, right? Sometimes, students need someone on the outside to show them what’s right in front of them. Sometimes, students need someone to show them what’s possible in the real world. When I was growing up, my mom often told me that I was a good writer. But who was she? Just a stay at home mom. What could she possibly know about writing? But my teachers, who had seen the writing of hundreds, if not thousands, of students had to know good writing when they saw it. Right? So when they told me that I could write, I believed them. Of course, I value writing. What about those kids who don’t? Perhaps they need to see writing through the perspective of other people — like small business owners. So when I decided I wanted to put my writing money where my mouth is and build reThink ELA this summer, I joined Angela’s Laptop Lifestyles Business Club where she is helping me learn how to find and better serve my customers (since I’ve joined and implemented some of her action plans, my email list has grown from 1,000 members to more than 8,000). All of these products involve communication with a customer — whether written or recorded on video — and many of those include teaching customers how to communicate via email, social media, websites, blogs, or other methods. You can show students the sales page Angela created using her designs and the written sales content from each bundle contributor. Who is the audience for this bundle? How have the contributors used their skills and talents to build an online business? Students can even analyze Angela’s income reports. What better way to show our students how important communication — and written communication specifically — is than to put our money where our mouth is. Not to mention, if you’re starting a small business of your own, this bundle can help you grow that business and provide the income you need to support your family — or at least your book buying habit. What a story you could share with your students about how you’re using your hobbies or expertise to provide additional support for your family, even though teaching itself doesn’t pay that much. Even better, my quickwrites unit is normally $14.97. With this bundle, you get my unit, plus more than $2,000 in products for just $27. And once you’re growing that business, share your successes — and your failures — with your students. Be real with them, and they will listen to you. Not sure about the quickwrites or the bundle? I absolutely love this post Michelle! I have to say if you’d have ever asked me as a kid or a teen what I wanted to be when I grew up the LAST thing I ever would have said was be a writer. But that is very much what I am! I write emails, blog posts, social media posts, reports, salespages and so much more. I write all the time as part of my business. I think the skill of writing can be learned and I’m soooo glad you’re out there taking on that job. Thanks so much for the shout outs! Thank you so much, Angela! I appreciate how much you’ve helped me with my writing — helping me figure out when to send emails, building my confidence, and encouraging me to jump out of my box. Teaching, business, and writing are all so much better when we do them together!